Bon voyage!! Enjoy those lattes and revel in brain laziness. You've earned a break and more Starbucks than Dublin can handle me thinks. Have fun and of course have yourself a very Merry Christmas! Enjoy Dublin, i'm looking forward to reading another years worth of posts from you too! Have a lovely Starbucks-filled Christmas of talking. Safe travels and Merry Christmas! Thank goodness you don't have to go through Heathrow! Joyeux Noël to you and enjoy your holidays! Have a wonderful time. Merry Christmas, Happy St Stephens Day and Happy New Year. Talk, talk, talk. Sara - My dog is an American Staffordshire Terrier! From a rescue! Got him as a puppy (5 months) when I was looking for an older dog. Holy crapinoli! Have a blast on your holiday and thanks for stopping over. Have a highly caffeinated holiday and enjoy every moment of it! 2. Have a blast on your trip and speak all the English you want! 3. We are going to Ireland in May so while you're there, make mental notes of where I HAVE to go while I'm there (for 12 days) and then let me know. Please. 4. I hope your airports are all clear! Merry Christmas Eve Eve! Have fun in Dublin!! I just made it home after a disasterous trip!I hope yours is smooth sailing :) Merry Christmas !!! December 23 has always brought greetings of "Merry Christmas Eve Eve!" in my family. Have a wonderful holiday, Sara, and enjoy your coffee (and remember...everything is better with Bailey's!). Merry Christmas, Sara! Enjoy your time in Dublin with English-speaking family and friends... just talk until you can say no more! That feeling of scoring the long-lost Starbie's and popping back into your favorite bar after being gone for a while - it's GLORIOUS!!! Talk up a storm, sister -(I'll be doing the same in English with my dad in Florida - except my dad located an old Italian woman for me to 'play with' - we all know it's a distraction.) Big hugs for you guys from icy Colorado this morning, safe travels, and a very Merry Christmas with your family! bon voyage et bonne annee! dearest sara... happy saint steven-ses and nollag shona to you and all the dubliners from me and the husband... good luck with your travels too - prepare to be freeeezing too! Bon Voyage and have a Blessed Christmas!! I hope you bring back lots of memories for us to read and enjoy. Looking forward to more of you and your wonderful experience in 2011!! Oh how fun. I am new to your blog and your life is already intriguing me. I also think of gingerbread lattes as Xmas in a cup. Nice to know more about you.. I am living in San Diego myself. I've definitely been enjoying getting to speak English all the time, but I'm finding pesky French phrases keep coming to my mind before English ones some of the time! Yesterday, my mom's cat was cleaning himself, and I wanted to say, "Look mom! Barney fait sa toilette!" What a lucky girl you are! I love Dublin! And sounds like your internal translator needs a break darling! 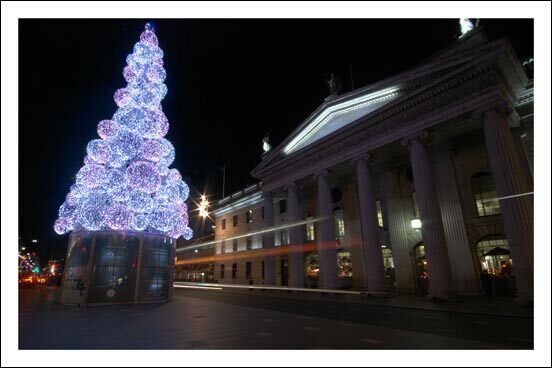 Hope you have a wonderful Christmas and enjoy Dublin! Ah, that tiny Dublin castle. It's so cute, I remember touring it and thinking that Irish people were playing fast and loose with the term castle. I hope you have an amazing holiday! And that you speak English to your heart's content. Have a very safe journey and a merry christmas!!!! Have a wonderful time. Hope your flights are smooth. Merry Christmas. Or should that be joyeux noel? Merry Christmas, Sara Louise! I'll be asking you all sorts of questions about Dublin when you get back! Have a fabulous trip to Dublin!! I know how much of a sweet relief it is to be able to turn off the language you're trying to learn (french) and return to english! Merry Christmas missy, enjoy your holiday away! Wishing you and the husband and the rest of the family a VERY Merry Christmas and a FBULOUS New Year! Looking forward to hearing about your Dublin adventures. Enjoy! Thanks so much for stopping by my blog! I appreciate it very much. Merry Christmas! Stay warm & of good cheer in Dublin. Best wishes for your husband and your family. I'm not sure if I'm more jealous of the fact that you're spending Christmas in Dublin or that you get to spend the rest of your time in France. safe travels and happy holidays to you and your family. take care. FUN! Have a happy christmas! I hope Dublin is fabulous! Please enjoy some gastropub goodness for me! Enjoy your time away - can't wait to hear about it all when you come back. A very Happy New Year to you and you family! Enjoy your holiday! merry christmas and happy new year! I had a comment but by the time I read through everyone else's I couldn't remember what I was going to say. I love all things France, I just do. Have you met @aladyinfrance yet? I'm so jealous! Ireland! I've always wanted to go there! My son is in the Air Force, stationed in England, been there for a year and coming home this Wed. That is the one place I wanted him to go so I could live vicareously, but, of course that's the one place he didn't get to! I'll raise my starbucks to you knowing you will have a wonderful time! Am looking forward to reading all about your trip! What a beautiful life you have! I admire you. I am now a follower of your blog!